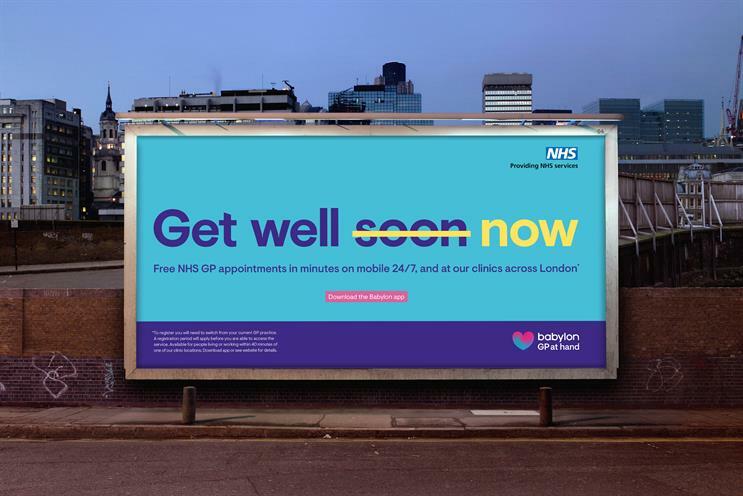 Babylon, the digital healthcare service, has launched an out-of-home and social campaign that highlights the immediacy of the app in the first work by newly appointed agency Karmarama. The work is designed to give patients more control of their health. Social activity explains the features of the GP at Hand app and the outdoor creative is a play on "get well soon", with "soon" replaced with "now" against a bold colour. The ads will run on Instagram and Facebook, as well as OOH sites across London. They were created by Tom Cleeland, William Millner, Joe Moloney and Suzi Paddison at Karmarama. PHD handled the media planning and buying. Karmarama picked up the account after a competitive pitch process that ran through AAR earlier this year. Brian Williams, executive creative director at Karmarama, said: "For many, healthcare is less accessible than an artery-clogging pizza. "Babylon is bringing change to this space akin to the changes that have revolutionised travel accommodations, music and transportation, and we’re proud to collaborate with them as they shrink the distance between Londoners and healthcare to a matter of minutes."